The industrial style in home interiors is nothing new. In fact, it has been around for a good number of years. But, the fact that its unwavering popularity shows no signs of abating, proves that this style is here to stay. In this blog post, we’ll take a look at how this style came to be, what the main elements are and what to look out for when choosing a worktop to complement your new industrial style kitchen. Industrial style first sprang to prominence in the 1980s and 1990s, when former industrial buildings such as docklands warehouses, old mills and factories, started to be transformed into des res apartments for up and coming young professionals. Indeed, it was this association with young and affluent “yuppies” that made the industrial style very desirable. Original industrial features, such as rough brick walls, wooden beams, floor boards and even radiators and lighting fixtures were left in place, combining the new and the old in an altogether different look and feel. As the decades rolled by, this style was refined and now you will find many home interior retailers who offer the whole look, selling faux repurposed wooden furniture, stone effect tiles, and mock industrial lighting. What elements will you find in industrial style kitchens? Walls and floors are absolutely key in industrial style kitchens. If you are lucky enough to live in an older property, one great way of enhancing the look is to remove plasterwork and expose any bare brick walls. You can either choose to keep the original brick colouring or whitewash to achieve the style. Of course, this type of work is expensive, with repointing and sealing very necessary, and if you live in a modern home, you may not have this option. If so, there are some other options open to you. Metro tiles are a great way to create an industrial look, whilst brick style wallpaper achieves a similar style. One other thing you can do is to create a concrete effect painted wall, by dry painting on a light grey colour and the daubing a darker grey over the top with a rag, whilst the undercoat is still wet. The first thing that springs to mind when you think of flooring in industrial style kitchens is floorboards. Again, if you’re lucky enough to live in a home with gorgeous wood flooring as an original feature, you’re well on the way to achieving the look. The major drawback of exposing your floorboards is the care and attention you have to give to them to make them last, and in modern homes, this simply may not be practical. There are some great alternatives though. Forget the pots & pans! 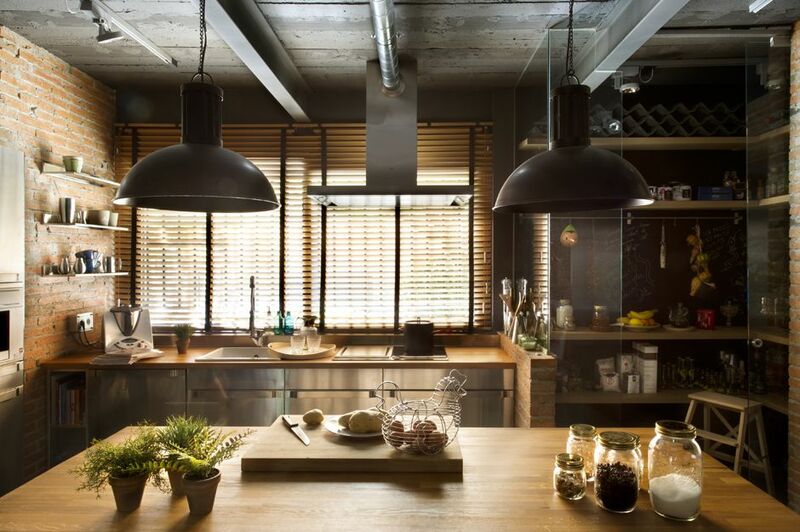 Rough brick walls and wooden beams really help enhance an industrial style kitchen. Wood effect tiles can give off the appearance of weathered wooden boards. There are also now some great options in vinyl which provide a weathered wood effect finish. Plus, the great thing is, these types of flooring are incredibly hard wearing, need nothing in the way of maintenance, apart from the occasional clean with a mop and detergent, and will look great for years to come. Stone or concrete are also good surfaces for industrial style kitchens. You can certainly achieve this look through careful selection of floor tiles. The industrial style heavily promotes a recycled and repurposed look, with older furniture pieces being reused in inventive and fun ways. Furniture items that combine elements such as wood from old pallets or boxes and upcycled copper piping are particularly popular, as are mobile furniture on wheels, which are particularly useful when creating a multi-functional kitchen space. Kitchen lighting is an area where you can really let your creativity flow when it comes to achieving the industrial style. You’ll find a wide range of industrial style halogen lamps and chrome fixtures that have been made with a nod to the industrial heritage look and feel. Copper and other metals make great surrounds for this type of lighting. To keep things feeling open and airy, rather than dark and oppressive, it pays to look for a lighter rather than darker colour for your kitchen worktops. Whites and greys are the most popular choices and you’ll find they work well with your overall decor. However, stone effect or wood effect worktops will really help to bring out the industrial effect. Limestone is a material that is making real in-roads this year, as it helps soften the look, creating a soft industrial style. If you have cash to splash, why not treat yourself to a genuine hardwood or solid surface worktop? However, if you are more budget conscious, there are plenty of laminate worktops available online which will finish your design off nicely without breaking the bank.